Why rebrand? Why now? Why KEEN? Same awesome company. Way more potential. Rebrands can be exciting times, and with the Pure Vision to KEEN Creative rebrand, we couldn’t be more thrilled. A brand isn’t just a logo, or a website, or a tagline. It’s a reflection of who you are and what you have to offer the world. It is a critical element of your business that should have the potential to grow with your company. It is something that your team should feel proud of and your clients should feel connected to. We have always championed good branding for our clients over the years, spending time learning about who they are and what they offer to make sure their branding is the best reflection of their business. After 13 years of growth and change within Pure Vision, the brand needed an overhaul. It was high time that time we practiced what we preached, and a new year seemed like perfect timing. With our rebrand, there is no fundamental shift in our business or values. In fact, the Pure Vision values are essential to who we are, and we believe they’re the reason we are successful. We’re the same awesome creatives, but we needed a name that we felt encompassed those values and that would allow us to continue expanding our services. When Matt Aubin first created Pure Vision in 2003, it was his personal photography business. 13 years and 19 team members later, Pure Vision had become a full service marketing, design, web, photo, and video firm. We’ve come a long way from wedding photos and family portraits and the name just no longer fit. More than anything we wanted a name that every team member could feel a sense of pride and ownership over. We work as a unified team, and it was important that our name reflected us as a whole. Plus, we kept getting emails from people asking if we sold eyeglasses. 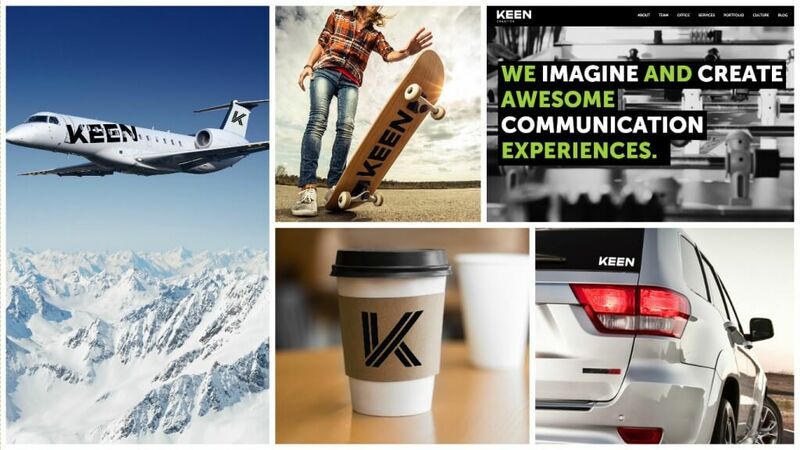 So how did we come up with the new KEEN branding? The first hurdle was coming up with a new name. We wanted something that we all felt proud of, that reflected our values, our personalities, the work we do, and the experience we provide our clients. A name that each person here helped create and that we could all claim ownership over. Really, it was just a matter of doing what we do for our clients: brainstorming, evaluating, more brainstorming, and eventually settling on a few really solid choices. First, the team got together and came up with literally hundreds of words we felt personified the company, our services and employees, and the experience our clients have working with us. 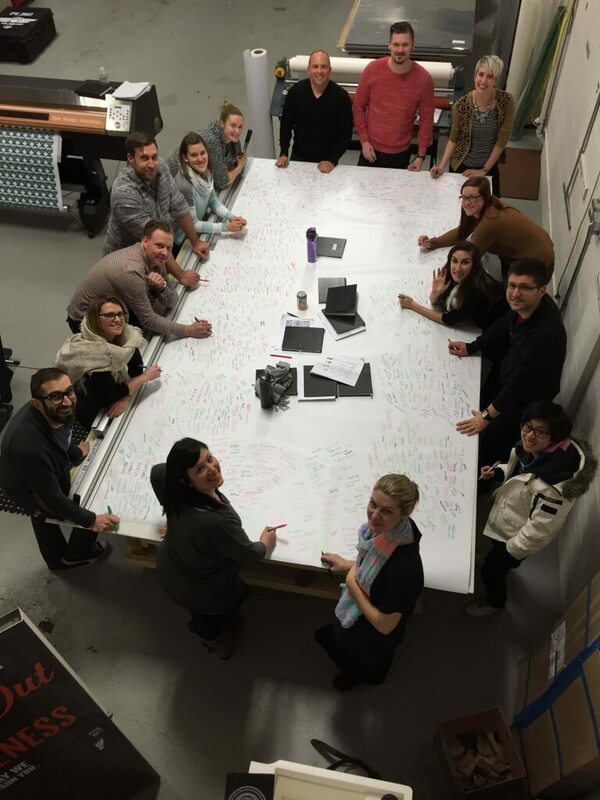 One beer-fuelled brainstorming session had us covering an entire 7’x12’ table in collaborative mind maps, with each team member circling the words they felt most connected to. Categories and themes were created, more brainstorms were done, and we narrowed down the list to a manageable group of words that represented who we are. Truly KEENers, we felt the new name not only encompassed our feelings about who we are and the work we do, but also allowed us to expand our services; building bigger and better ways to help our clients. Anyone who has developed a logo–for a client or for themselves–knows just how difficult it can be. It was no different for us. The goal of this rebrand was to be a reflection of us as a group; therefore, every one of us had to feel connected to our new logo. Pinterest boards were made, hand renderings were done, and hundreds of sample logos were developed by every member of the team. We decided early on that we wanted the logo to be simple but customizable, focusing on text and lettering rather than any sort of graphic. 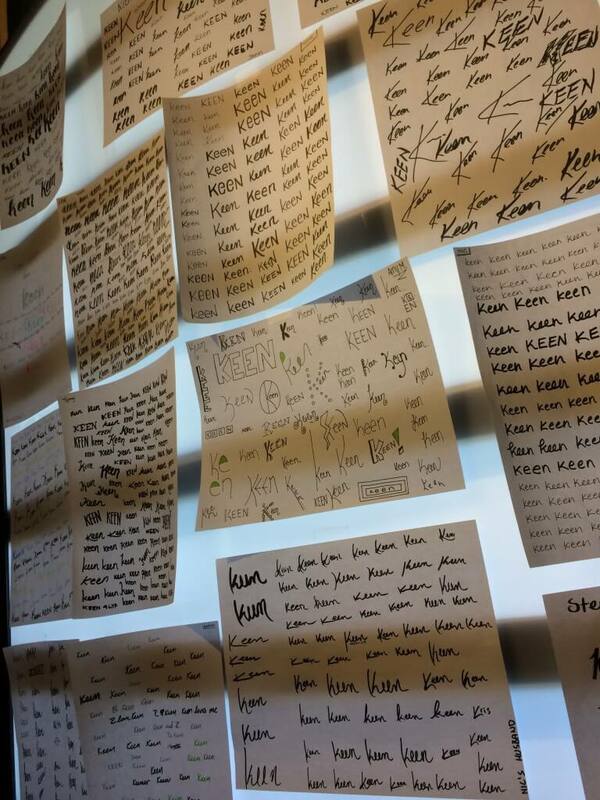 The name KEEN had become so important to us and we worked so hard on it that we felt the word deserved to have all the attention. We wanted the font to be our own design, so we wrote the word “keen” over and over until it didn’t even seem like a word anymore. Just when we thought we had settled on a design, our Web Director Kris told us he probably wouldn’t wear a shirt with that logo on it, so back to the drawing board we went. (Okay, there was more to it than that, but Kris’s desire to wear the logo on a shirt became a qualifier for the new design). Kris in a KEEN shirt. We had secret ballots, revisions and more creative exercises. We narrowed the options down to our top 7 and created mockups of the logos on different items. The mockup process was crucial to our decision and is a practice we encourage for all our branding and rebranding clients. It can be difficult to see the potential with an isolated logo on a white page, and a mockup gives context that can really drive a decision home. After seeing the KEEN logo on cars, coffee sleeves, our website, and even a jet (one day, we swear) we all ranked our favourites, based on the logo itself, its ability to transcend current service offerings, and whether or not Kris would wear it on a shirt. The winning design was aesthetically simple and held a ton of potential for future customization. While the basic KEEN would be used as our primary logo, we all had the opportunity to customize our own versions for our business cards and other applications, like our Christmas card, the website, etc. 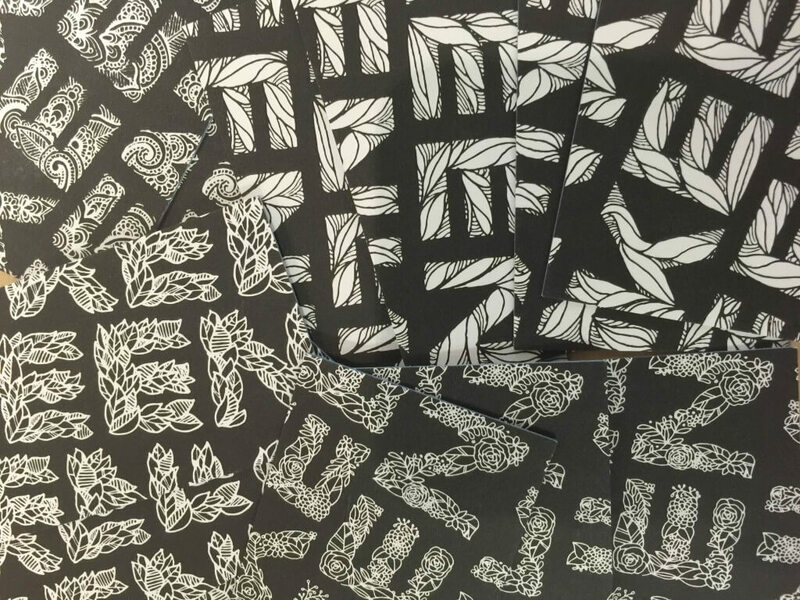 We got some solid doodling time in and created a multitude of creative, personalized KEENs. Up on the wall they went again, and we each chose a design that we connected with personally for our business cards. Make a game of it and collect them all! Some of the many KEEN business cards. What can we expect from KEEN? This rebrand is a result of our growth, and we don’t have any plans of stopping. Expect the same creativity, the same fun experience, the same great work quality, and the same all around awesomeness as before, but kicked up a notch. With KEEN, we’ll be able to serve you better, offering new services and skills to round out your experience with us. We will continue to offer our standout marketing, web design and development, graphic design, and photography services as always, now with the addition of services like web writing, grand format printing, videography, content marketing, social media management, and digitals strategies. We’ve got big plans for the future and we hope you’ll be along for the ride! We’re KEEN. We’re creative. And we can’t wait to work with you.